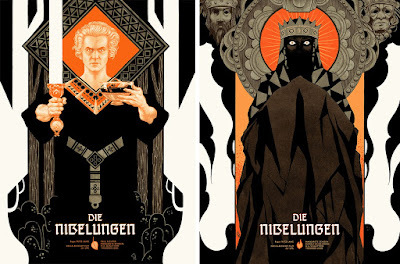 To celebrate Lang’s crowning achievement, Mondo and Black Dragon Press are releasing two posters for Die Nibelungen by Vienna-based illustrator Peter Diamond. “Die Nibelungen: Siegfried” and “Die Nibelungen: Kriemhild’s Revenge” will be available to purchase at a random time today, Tuesday, July 31st, at the Mondo online store and at 5PM UK time at the Black Dragon Press online store. Each Die Nibelungen movie poster by Peter Diamond is an 18”x24” hand numbered screen print. Both prints are limited to 70 pieces and will retail for $55 / £40.